The story of what young scientists learned about a million-year-old single cell soil bacterium and how to use that knowledge to genetically modify a variety of plants to make them safer and healthier. 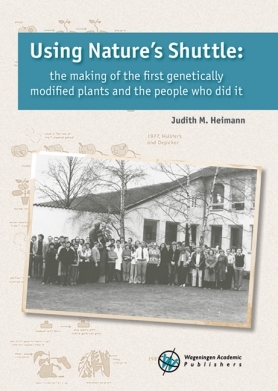 'Using Nature's Shuttle' is a suspenseful, by turns comic or tragic, but always lively account of how young, idealistic scientists - often the first of their families to go to a university - engaged in basic research that led them to make history in the new fields of plant microbiology and molecular biology. The book passes on the true story of what young scientists in a public Belgian university learned about a million-year-old single cell soil bacterium. This bacterium was able to genetically modify certain plants to produce food that only that bacterium strain could eat. These scientists and their colleagues and rivals figured out how to use that knowledge to genetically modify a variety of plants to make them safer and healthier for man, beast, and the environment. Their genetic modifications made plants cheaper and easier for farmers to grow as well as capable of improving the health and welfare of people in the Third World. The author, Judith M. Heimann, a former diplomat and writer of three published non-fiction books and contributor to two TV documentaries based on them, tells this multi-sided story chiefly through the information she gathered by conducting intensive interviews of each of more than two dozen of the scientists involved. She sees this book as presenting the actual science, as opposed to the current rash of anti-science on this subject, and as encouraging a new generation of young people to opt for careers in STEM (Science Technology Engineering Mathematics subjects).